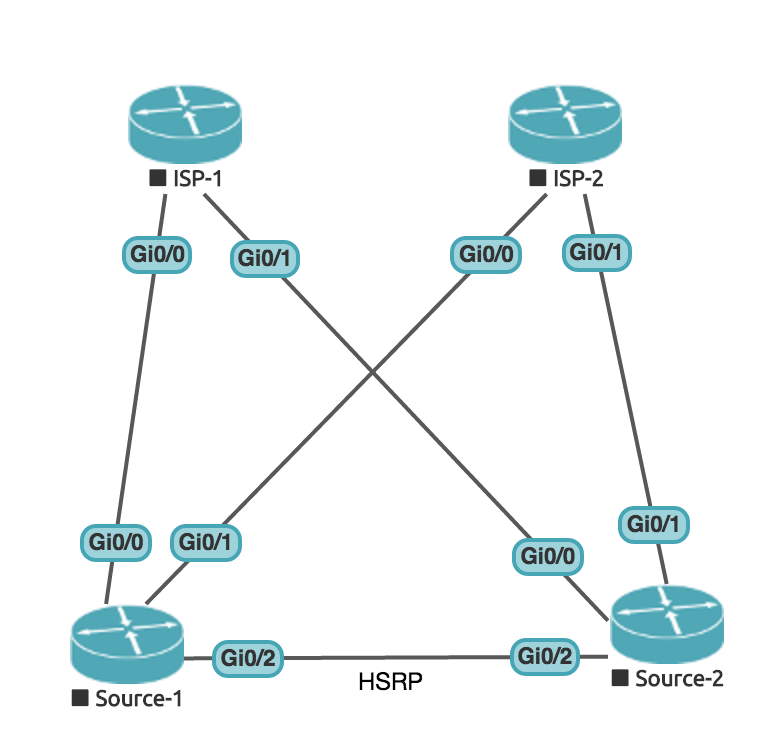 There was a question posted in a Facebook CCNA group today, regarding redundancy over different ISP links, and whilst the suggestions were good, most favoured HSRP, or one of the other FHRP protocols, over something like IP SLA. There are two static router to different ISP like this. so my question is, The ISP one is went down so is it possible to divert the all traffic to ISP2 automatically? 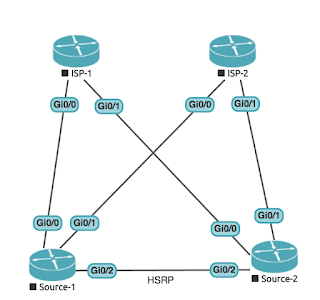 So, before we look at the solution, let's explain why HSRP (and by extension, VRRP and GLBP which make up the FHRP, or First Hop Redundancy Protocols) are not the the right solution in this instance. When is FHRP the wrong choice? We would have two routers, Source-1 and Source-2, and they would be joined in an HSRP group, providing the internal users and devices with a virtual IP address to connect to. In the event that one router went down, the other would take over. Back to our conundrum. How would we provide the redundancy we need? The answer here would either be through floating static routes, redistribution from the ISP, or IP SLA. This works, we can send all our traffic through ISP-2 and get to 10.0.0.1, but shows that the floating static route only really works if the problem lies with us, not with an upstream device. Let's turn the network up a notch and set ip IP SLA tracking. IP SLA is a feature that allows you to implement some monitoring of a line, we can use it to ping devices and if a failure is detected, make changes appropriately. We will do this by adding another loopback address to the Destination router, and track that. We will also turn the interface on the Source back on, and remove the floating static routes. Notice the routing table and the trace, this shows that both routes are working at the same time. Now let's set up tracking! We start by creating an IP SLA entry, with a number. 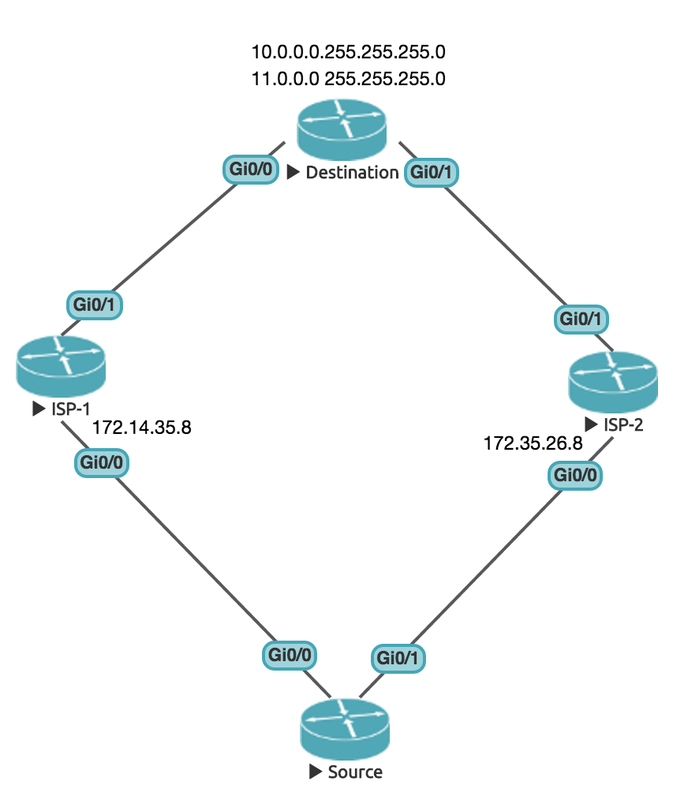 We then use an ICMP echo to track the IP address 8.8.8.8, through our Gi0/0 interface. We send five pings, we need to schedule it to start, and also set up a tracking object that references the SLA entry we created first. Above, if we shut down the Lo8 interface on the destination (the object we are tracking), our traffic goes through ISP-2. Let's add another tracker, and protect all our routes! IP SLA works really well, in conjunction with floating atatic routes, and can be used to redirect traffic within a few seconds. In the real-world though, you would track more than one address, so that in the event that it is a particular end-point thats failed, outside of your network, you don't go reconfiguring the network for everyone. Instead you would track three addresses (or so), and then if all three fail, chances are the linked is messed up, at which point failing over to a different link would be a good idea. 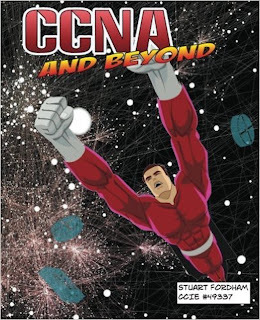 HSRP, VRRP and GLBP are all covered in the CCNA and Beyond study guide, which you can purchase now, or read a sample. You can download the UNetLab file for this here.